Yep, this beer tastes a lot like the expensive beers are tasting nowadays… the expensive barrel aged ones. At $20 a bottle Destihl really does have to deliver a product that their customer is expecting, which in this case delivers a 6 out of 7 barrel power metric. Actually, its a “foudre” not a barrel, and its “imperiale” not imperial, and it’s “destihl” not distill, and yes, all that is stupid. Well, at least they aren’t writing in emojis, and they have a good cover every time they mispel smoething. The tastes in 1920 are all over the place. I’m getting sweetness, like dried fruits rolled up into a giant Cuban cigar, smoked and chewed at the same time. But not too much smoke is getting through, which is fitting because this really isn’t a smokebeer. It does say “slight smoke” on the side of the bottle, and the Binny’s computer told me it was, so here we are. Even with the minimal smoke, there is plenty to keep me busy in this glass. A snifter would be more reasonable, but I’m happy with my pint’plus glass. I would be even happier with a bomber, or even a champagne bottle, all poured into a big ole stein, but now I’m getting into the value metric. Beer snobery isn’t a poor man’s game so I come prepared, but it still is frustrating when someone pushes the envelope in regards to getting my money. The taste is robust, asphalty, reminds me of The Bruery Smoking Wood, but less smoking. Destihl musta packed tons of grains and ingredients in there. It was a bold move to age for a year in a French Cognac oak foudre (which means barrel), which yielded a bold beer. Final score – a respectable and expensive 5 out of 7. Brewer’s Description In the spirit of the Franco-Belgian Military Accord of 1920, this beer unites a Belgian-style Imperial Stout with one-year aging in a French Cognac oak foudre, coalescing into aromas and flavors similar t dark roast coffee & dark chocolate, black cherries, plums, hints of molasses and slight smoke, all pairing beautifully with the French oak tannins, medium body, gentle warming and dry finish. Food Pairings Illusions of upper middle class bar fare (must use words “creative, hand crafted, artisinal, fusion, local, and sustainable,” for approved public dialogue). 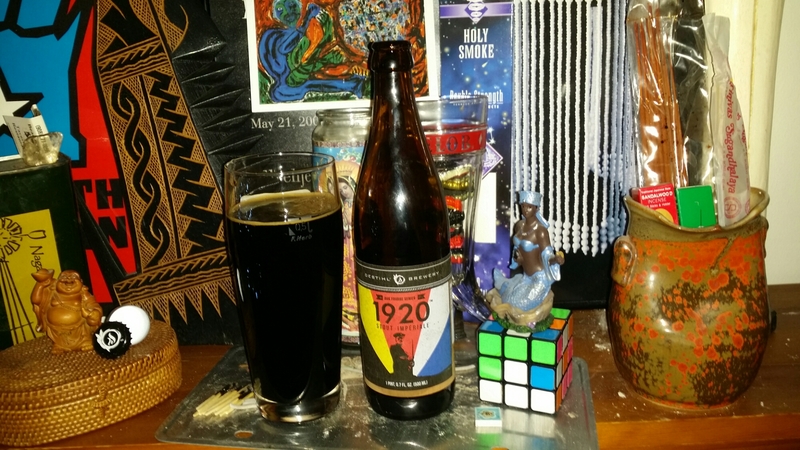 This entry was posted in Beer, Educate, Enlighten, rauchbier, Smokebeer and tagged 5 - 6, barrel aged, boozy, Destihl, drunk, Illinois, imperial, Stout. Bookmark the permalink.